A large and dramatic J. B. B. 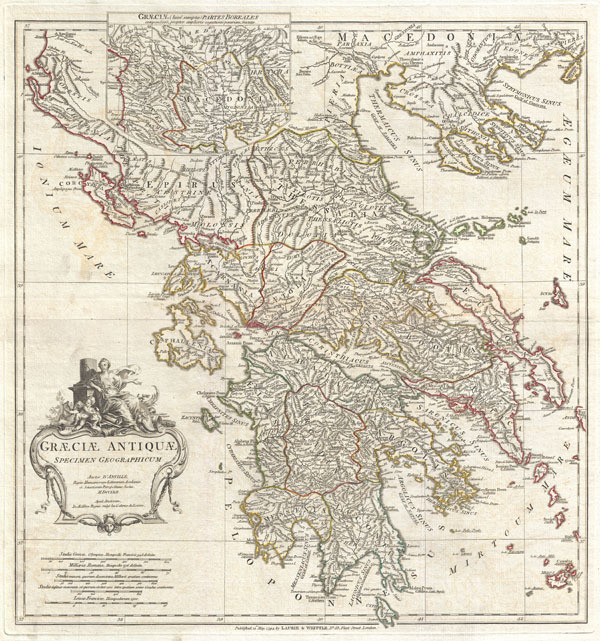 D'Anville map of Ancient Greece. Covers from Macedonia to the Peloponnesus, inclusive of Euboea and the Ionian Isles. Details mountains, rivers, cities, roadways, and lakes with political divisions highlighted in outline color. Decorative title cartouche in the lower left quadrant depicts an ancient Greek woman lounging against a Tuscan column while two cherubic children create art. Includes five distance scales, bottom left, referencing various measurement systems common in antiquity. Text in Latin and English. Drawn by J. B. B. D'Anville in 1762 and published in 1794 by Laurie and Whittle, London. Jean Baptiste Bourguignon d'Anville (1697-1782) was perhaps the most important and prolific cartographer of the 18th century. D'Anville's passion for cartography manifested during his school years when he amused himself by composing maps for Latin texts. There is a preserved manuscript dating to 1712, Graecia Vetus, which may be his earliest surviving map - he was only 15 when he drew it. He would retain an interest in the cartography of antiquity throughout his long career and published numerous atlases to focusing on the ancient world. At twenty-two D'Anville, sponsored by the Duke of Orleans, was appointed Geographer to the King of France. As both a cartographer and a geographer, he instituted a reform in the general practice of cartography. Unlike most period cartographers, D'Anville did not rely exclusively on earlier maps to inform his work, rather he based his maps on intense study and research. His maps were thus the most accurate and comprehensive of his period - truly the first modern maps. Thomas Basset and Philip Porter write: "It was because of D'Anville's resolve to depict only those features which could be proven to be true that his maps are often said to represent a scientific reformation in cartography." (The Journal of African History, Vol. 32, No. 3 (1991), pp. 367-413). In 1754, when D'Anville turned 57 and had reached the height of his career, he was elected to the Academie des Inscriptions. Later, at 76, following the death of Philippe Buache, D'Anville was appointed to both of the coveted positions Buache held: Premier Geographe du Roi, and Adjoint-Geographer of the Academie des Sciences. During his long career D'Anville published some 211 maps as well as 78 treatises on geography. D'Anville's vast reference library, consisting of over 9000 volumes, was acquired by the French government in 1779 and became the basis of the Depot Geographique - though D'Anville retained physical possession his death in 1782. Remarkably almost all of D'Anville's maps were produced by his own hand. His published maps, most of which were engraved by Guillaume de la Haye, are known to be near exact reproductions of D'Anville' manuscripts. The borders as well as the decorative cartouche work present on many of his maps were produced by his brother Hubert-Francois Bourguignon Gravelot. The work of D'Anville thus marked a transitional point in the history of cartography and opened the way to the maps of English cartographers Cary, Thomson and Pinkerton in the early 19th century. D'Anville, J. B. B., Complete Body of Ancient Geography, Laurie and Whittle, London, 1795. Very good condition. Original centerfold. Platemark visible. Blank on verso. Rumsey 2603.043. Phillps (Atlases) 571, 572, 599.